Less than two weeks ago, the Syracuse Orange men’s basketball team picked up a commitment from Netherlands native Jesse Edwards, the fifth member of SU’s 2019 recruiting class alongside Joe Girard, Brycen Goodine, John Bol Ajak and Quincy Guerrier. At this juncture, it’s likely that Syracuse is done recruiting for the class of ‘19 and will now look to enroll its incoming freshman class for the early summer session. It’s been announced that Syracuse basketball will take a preseason tour to Italy in August. In order for players to meet eligibility requirements for a foreign tour they must to be enrolled one semester prior to the trip. With Syracuse’s 2019 class likely set, the Orange can turn the page on its recruiting focus to 2020 and beyond. Should Oshae Brissett decide to return to Syracuse for the 2019-20 basketball season, Jim Boeheim’s roster would be full with 13 players, none of which would be seniors. That doesn’t leave room for a scholarship in the class of 2020, but as we know from past seasons a spot or two will likely open up. According to 247, Syracuse has offers out to Andre Jackson, Taelon Martin, Addison Patterson, Isaiah Jackson, Isaiah Cottrell, Woody Newton, Jamari Sibley, Noah Collier, Hunter Dickinson, Dain Dainja, Cliff Omoruyi and Elijah Hutchins-Everett. Only Andre Jackson and Collier are “warm” right now but Syracuse will visit Newton soon. Jackson is a top-40 recruit out of Albany who once hinted at teaming up with Girard, his former Albany City Rocks teammate, at Syracuse. He visited Syracuse on Feb. 5 for the Florida State game. Jackson does a lot of stuff and things (plus things and stuff) around the rim. 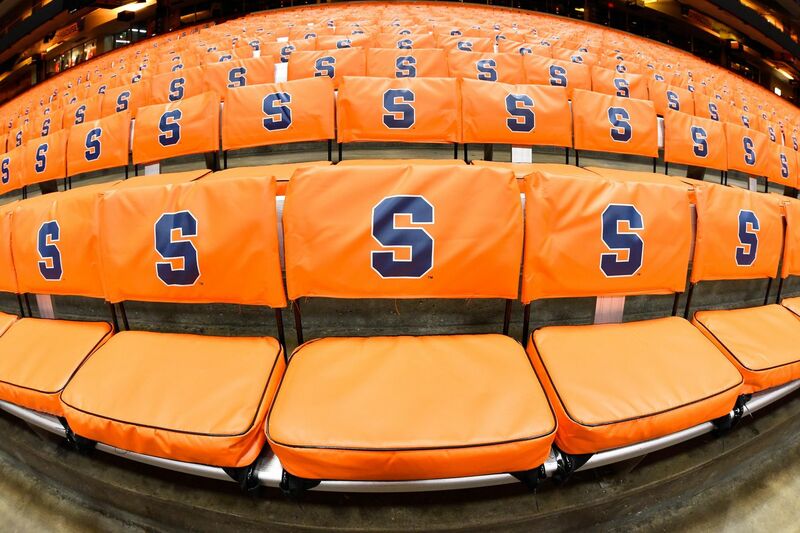 In the class of 2021, Syracuse has offers out to Terrence Clarke, Franck Kepnang and John Camden. Clarke, a 6-foot-6 guard, is the No. 2 ranked recruit in his class and plays his high school basketball at Brewster Academy in New Hampshire. Boeheim and Gerry McNamara recently visited with him, per Donna Ditota. Kepnang is a 6-foot-10 center and teammate of John Bol Ajak at Westtown School. Currently, he’s ranked No. 16 in the 2021 class according to 247. Camden is a 6-foot-7 guard/forward who also played at Westtown before transferring to Archbishop Carrol this past season. He took an unofficial to Syracuse for the Duke game on Feb. 23 and is ranked No. 49 in the 2021 class. It makes sense for Syracuse to swing big in the 2021 class in what will be Buddy Boeheim’s final season (barring anything unforeseen) in 2021-22. Syracuse does not have any offers beyond the class of 2021 as it stands now.